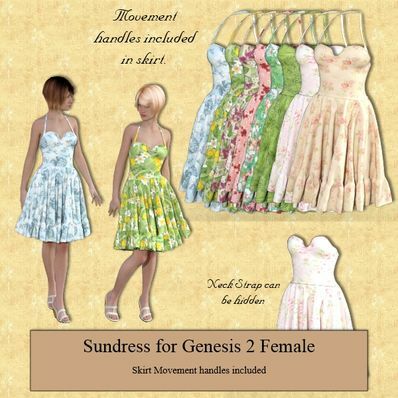 Sundress for Genesis 2 Female for use in Daz Studio 4.8. Love the dress! I was rather surprised when the email came announcing it for G3M. I figured that had to be a typo. It's funny, the email says G2M. Haha! Wonderful Dress. Very well done. Thank you! Thank you for being so generous, and for continuing to support G2F! Thank you so much for another fine product!!! Oh, so pretty and modest, just love it! All the textures look wonderful. Thank you so much! What a nice dress and awesome textures. Thanks a lot.